Thanks to today’s guest scriptwriter Caspar Melville. I studied a bit, therefore I knew this would happen. If Helen Keller fell over in the forest, would she make a sound? Okay, this is a dumb joke, but it was banned by an American network because it was taken to be insulting to Helen Keller, when in fact it was an epistemology joke. Rare things, those. I think this strip is only the second one I’ve encountered. Great strip, Author. Gimme an e, gimme a p, gimme an i, gimme an s, gimme a t, gimme an e, gimme an m, gimme an o, gimme an l, gimme an o, gimme a g, gimme a y. Whaddya got? EPISTEMOLOGY. 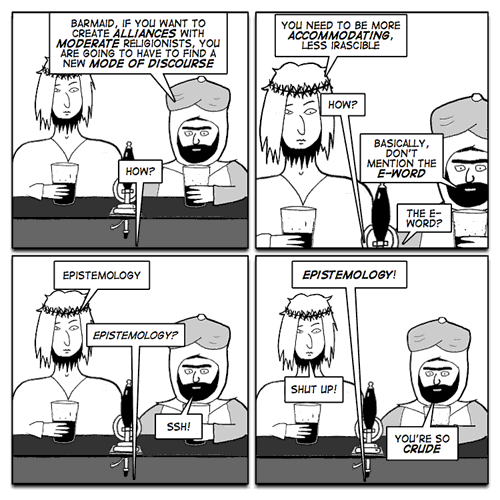 Boomalacka, boomalacka, boomalacka, boom – GO epistemology! AND epistemology heads the ball right past the goalkeeper and the crowd goes wild. Ophelia: don’t be so shrill and strident! Is that Episte M. O’Logy who played silly mid-off for Blackburn Rovers in the Davis Cup third place play-off at the Neasden Olympics? For sheer entertainment, look it up in the Catholic Encyclopedia. When Descartes’ father dropped the non-swimming young Rene in the river, the boy was heard to say “I sink, therefore, I swam”. This was the origin of an epic misquote that lasted the rest of his life. Was that article written by an octopus? Actually, I quite liked the linked article. The linked article neatly captures much of what I find troubling about journalism. Shallow, sensationalist and specious. “We are bored with the new atheism”. “It used to sell column inches”. That pretty much sums up a number of journos for me, I’ afraid. They peddle sensation, not debate, however they frame it. Scientists need to be very careful how they deal with the media. A mate who liased between the MOD and the media once told me that there are only four characters in a journos world- Hero, villain, victim or freak. They pigeon-hole hole you into one of those and then proceed from there. When you no longer fit one of these infantile narratives they get bored. Which ology has ‘e pist, M? There is an interesting Philosophy of Religion discussion about this strip over at Jerry Coyne’s place. So, it’s good to let epistemology behind in order to create alliances between atheists and moderate religionist. Very good indeed! Epistemology assumes that knowledge is possible. To some extent, this is as absurd as Theology (which assumes that god is possible). So, forget epistemology! If you forget epistemology, then ontology can be also let behind. Then, the question of god’s existence is made irrelevant. Without epistemology and ontology, we can go further and reach a Nihilistic stand. No. It’s difficult not to believe in birds. Atheists is so cute when they use big words. 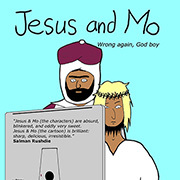 This is my favorite Jesus and Mo.